This is usually an article about fishing, so what does waterfront living have to do with that sport? Fishermen are one of the top markets for this type of home and while there are a large number of non-fishermen that live on the water, an assessment of the pros and cons should interest anyone thinking of relocating to a waterfront home. I live on the water and love it. Since 1978 we have enjoyed having a place on the water whether as a permanent home or weekend place. Throughout those years I have experienced just about all of the pros and cons associated with owning property on the water both as a weekender on a canal in the Sea Isle Subdivision on West Galveston Island and as a permanent resident on Lake Madeline in Galveston. Still, I do not desire to live elsewhere. The first thing I want to emphasize is that living by the water is not for everyone. Those that enjoy the water most are owners who benefit from the location and not just the view. Fishermen and boaters are the two top candidates for having a place on the water. For purposes of this article our discussion will be focused on properties fronting on the bays and canals and creeks leading into a bay system. 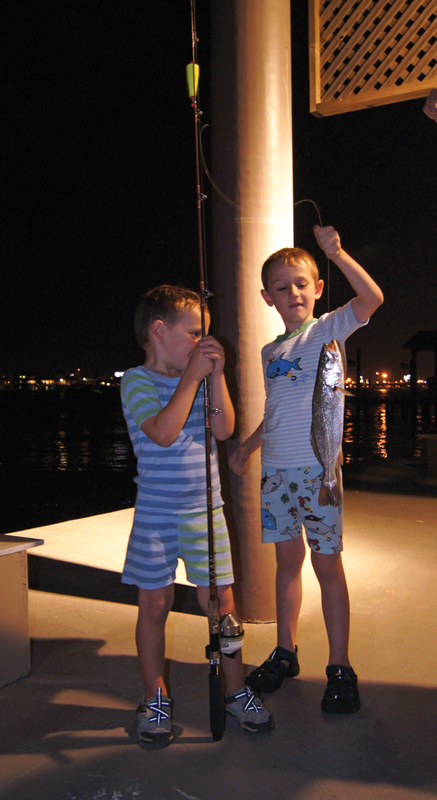 Alex Meyer and his brother Andrei with a fish caught off their grandparents dock. Fishing is one of the big selling points for locating on the water. Having a private dock to fish from is a real luxury, especially at night when your lights, underwater and overhead, attract lots of fish. A boat slip attached to your dock or bulkhead allows you to use your boat more, fish more and come and go quicker than if you were having to make it to a launching ramp or marina. It also allows for more spontaneous trips that might not be made due to the hassle of launching or driving to where the boat is kept. Kayaks and small aluminum boats and sailboats like the Sunfish can be easily launched and retrieved from most bulkheads and docks therefore elimination the need for trailering. In many areas swimming from one’s own dock is an added attraction. The views of the water along with sunrises and sunsets sell the property and the other benefits are just lagniappe for enticing a purchaser. The more you benefit from aspects other than the view, the easier you will tolerate the negatives. Now, let’s discuss the bad side of living on the water. The initial cost of waterfront property all along the Galveston Bay Complex has skyrocketed over the past decade. Most of the newer homes have drifted away from the smaller weekend houses on pilings commonly seen along older subdivision canals to high-dollar homes bordering on mansions. The initial cost is just the beginning of the high expenses for owning a waterfront home. The higher the value of the property, the higher the taxes will be. Coastal living requires an additional insurance policy, windstorm coverage, which is normally part of homeowner’s insurance farther inland. Premiums for Flood and Windstorm policies for coastal residents have risen dramatically since recent hurricanes and for many residents are almost not affordable. An example would be to compare a waterfront windstorm policy premium to what the same amount of insurance offered in a conventional homeowner’s policy 50 miles inland would cost. It is likely that the windstorm premium would be close to that of a conventional homeowner’s policy that included windstorm along with fire and other insurance. In many areas, erosion is an issue with waterfront property which is not covered by insurance. Bulkheads are the preventative and must be maintained and replaced every 20 years or so depending on the location. Security is a big issue with waterfront homes, especially those with boats and boat docks. Thefts of boats and equipment are much higher than for boats stored most other places. The homes themselves are at much greater risk of burglary and vandalism. Waterfront occupants also have other issues with which to deal. Probably the most common headache is the wake of boats. In most areas where concentrations of homes on the water exist, a no wake zone has been established. Most boaters try to adhere to the five mph speed limit in such areas; however, many ignore it. Not adhering to the rule results in residents who get upset easily and stay in a state of frustration due to the wake washing against their bulkheads during periods of heavy boat traffic. If you cannot live with this, waterfront living is not for you. As mentioned earlier, I have experienced just about all of the pros and cons of a waterfront homeowner and still would not want to live anyplace else. For most newcomers to living on the water, after enjoying this lifestyle, most do not want to return to a landlocked home. My wife and I have been wanting to purchase a home on the water for a while. We really enjoy fishing and boating. We never took into account that there would be no need for a swimming pool because of the many different areas available for swimming. That’s something we’ll remember, for sure. You wrote that waterfront living is the best option for those who love fishing and boating. My father has been a huge fisherman for many years, and he’s been thinking about buying a vacation home. If he could get a home that would make fishing easy, I’m sure he would be very happy. Thanks for the great information.